I've been thinking for a long time that I wanted to start cooking some different dishes for dinner and making them more healthier. You see over the last few years, my weight has fluctuated and even though I am always smiling on the outside, I'm not so good on the inside. My health hasn't been so good and my recent doctor visit has been a real eye opener. You see, my blood pressure has been super high and I've been on the verge of becoming diabetic. So I've begun to cut back on caffeine, reduce my sodium intake, cut back on carbs, and exercise regularly. I've been searching for some recipes and thinking for some recipes and decided I'm going to come up with something of my own. I love seafood so a shrimp dish was a must for me. I also had to think of a dish that would be a hit for my family. I knew there was a possibility that my son might not like it because of the texture of the Quinoa. But I figured a 3 out of 4 was good outcome right? I grabbed my post it note and headed out to the market to grab the things I needed - which wasn't much, and then headed back home and started cooking. I dreaded chopping the onions. It makes my eyes burn so much, as I'm sure they make your eyes burn too. Sauteing them made the house smell too and I really am not used to my house smelling like onions and garlic the day after. This amazing dish serves 8 people. I saved the leftovers for my lunch and for my mom, since my dad is in Puerto Rico at the moment for my grandmother's birthday. I'll post the recipe below so all of you could try this amazing recipe out! Heat the oil in a large nonstick pot over medium high heat. Add the onion and saute until softened, about 5 minutes. Add 2 teaspoons of the garlic and saute for 1 minute, stirring constantly to prevent burning and adding droplets of extra olive oil if necessary. Add the uncooked quinoa and ½ teaspoon chili powder. Saute for another minute to add flavor to the quinoa. Add the broth, bring to a boil, cover and cook for 15-20 minutes, while keeping an eye. Adding broth instead of water, gives the quinoa flavor. When the quinoa is done, it will be soft throughout. Fluff with a fork and toss with fresh minced parsley. While the quinoa is cooking, heat 1 tablespoon butter in a large skillet over medium high heat. When the pan is hot and the butter is melted, add the shrimp and sprinkle with the remaining ½ teaspoon chili powder directly in the pan. Season with salt and pepper and saute until golden brown on the outside. Melt the remaining 5 tablespoons butter with the 2 teaspoons garlic to make a sauce for drizzling (for this, crushed garlic or garlic paste would work really well but minced is also fine). 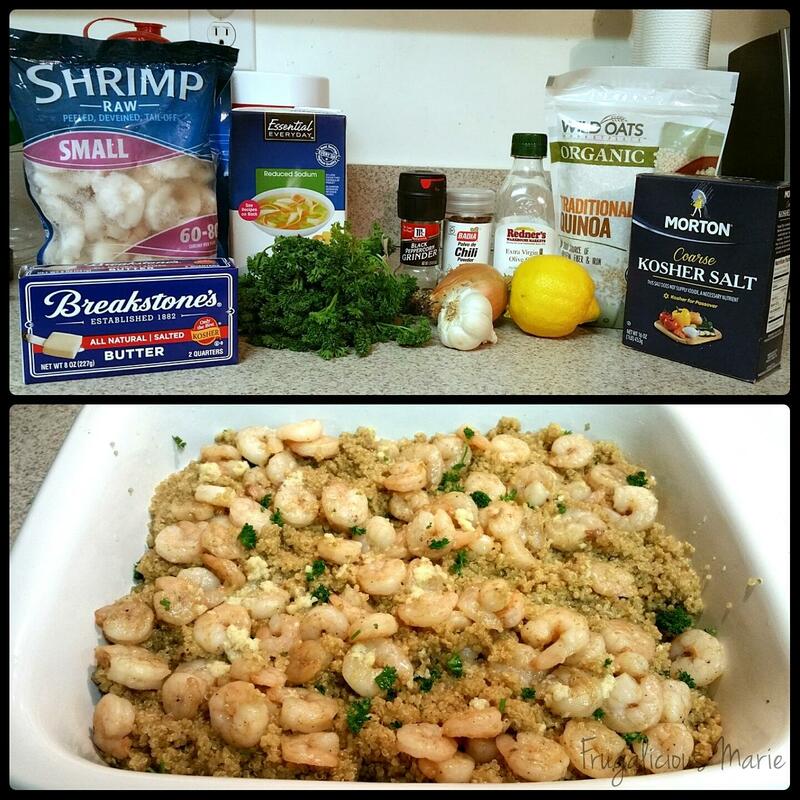 Serve the quinoa and shrimp together in one dish, topping with fresh chopped parsley and lemon juice if desired. When the butter is melted and cooled slightly, drizzle over the shrimp and quinoa. Serve immediately, while still hot. If it cools down then just stick it in the oven for a few minutes. The outcome of this dish was amazing. It was delicious. It was a hit with everyone except our son which was my assumption before making this. I hope all of you love this just as much we did. The next time I make this, I promise to take better pictures. I didn't expect for this to come out good. I for sure thought I was going to have some sort of kitchen disaster on my hands. I was glad that I only paid for the chicken broth, slated butter, fresh parsley, lemon, and the sweet vidalia onion. That was a whopping $6.91! Everything else I had at home! The chicken broth was $1.99, the salted butter was $2.89, the bunch of fresh parsley was $1.18, the lemon was 67¢ and the sweet vidalia onion was 18¢. Not only was this meal delicious, it was easy on the pockets! Being healthy doesn't mean you have to break the bank. You can be frugal and save money. I will be bringing you a recipe each Wednesday that is healthy and cheap! Stay tuned!